Cogar is an Australian-owned and operated company that has been providing civil construction and maintenance services to many industries for over 30 years. The company has worked with some of the largest telecommunications, construction and utilities companies in the world, largely through its reputation as being a company that is dependable, cost-effective and true to its word. Cogar encourages a culture of communication, ethical conduct, mutual trust and teamwork within its management team, among its contractors and with every client. Our ability to manage the achievement of our projects on time and on budget has lead to continued repeat work as well as the development of strong and long lasting relationships with both government and industry. Cogar’s reputation was forged through excellence in the gas and water industry and has now expanded into the colossal telecommunications industry, where most of its work now takes place. Part of Cogar’s efficiency and cost-effectiveness is its experienced management and planning team. 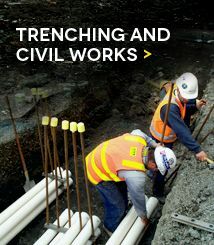 Cogar employs regular review and introspection of its management and work procedures and techniques to ensure that it continues to be a trusted and reliable provider of civil works, cable hauling, optic fibre installation, directional drilling, project management and many civil construction projects. Cogar is often contracted to perform long and short distance cable hauling and cable installation in urban, inner city, suburban and regional situations. Cogar was part of the Victorian Government’s ‘Smart Schools’ project, where Cogar’s cable hauling skills and experience brought optic fibre cable installation to over 1500 schools around Victoria. 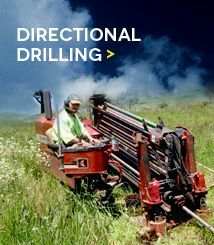 Cogar has extensive experience in horizontal directional drilling through populated, regional and remote areas. With no project too large or too small, Cogar has a wide range of different sized drills, drilling equipment and experienced personal to accommodate a variety of projects and situations. Our capabilities include drilling from 63mm up to six-way P100 duct runs with long distance drilling – a task Cogar has excelled at on past projects. 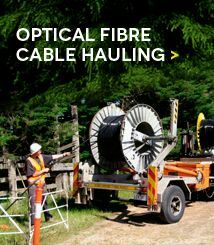 Cogar is one of the companies working on the Federal Government’s National Broadband Network scheme, managing optic fibre cable installation to many inner city and suburban Melbourne locations. 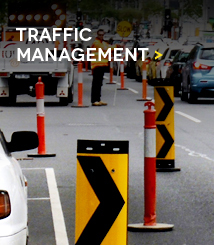 Part of one of the largest telecommunications projects in Australia, this sees Cogar’s civil construction, cable hauling and installation work taking place over large areas requiring efficient project and traffic management to reduce disruptions to regular movement of residents and commuters. Cogar is happy to discuss and review any project proposal brought forward by a prospective client. Our experienced staff will discuss your needs, arrange a site visit and provide and cost-effective proposal to meet the budgetary and time constraints of the project. Contact Cogar by calling 03 9761 5333 (Monday to Friday) or contact us online for any further information about our services.